The capital of Richmond county, Georgia, received its first Jewish settlers about 1825, when a Mr. Florence arrived with his wife. 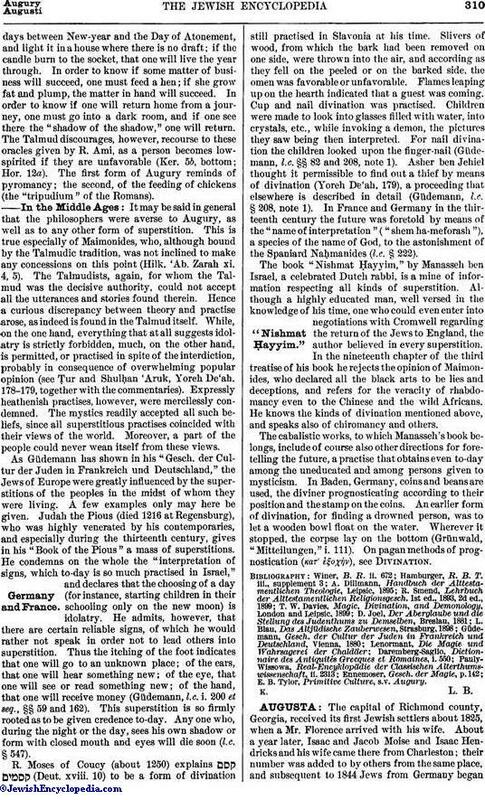 About a year later, Isaac and Jacob Moise and Isaac Hendricks and his wife came there from Charleston; their number was added to by others from the same place, and subsequent to 1844 Jews from Germany beganto find their way to Augusta (Markens, "The Hebrews in America," p. 113). It has a congregation, Children of Israel, organized in 1850. The religious services were originally held in a hall, where the Sunday-school children also received their instruction. The first rabbi was Rev. H. S. Jacobs, who held that position from 1860 to 1865. During the Civil war many Israelites from Charleston came to Augusta, thus considerably increasing the members of the congregation. During that time a cemetery was acquired and a benevolent society formed. 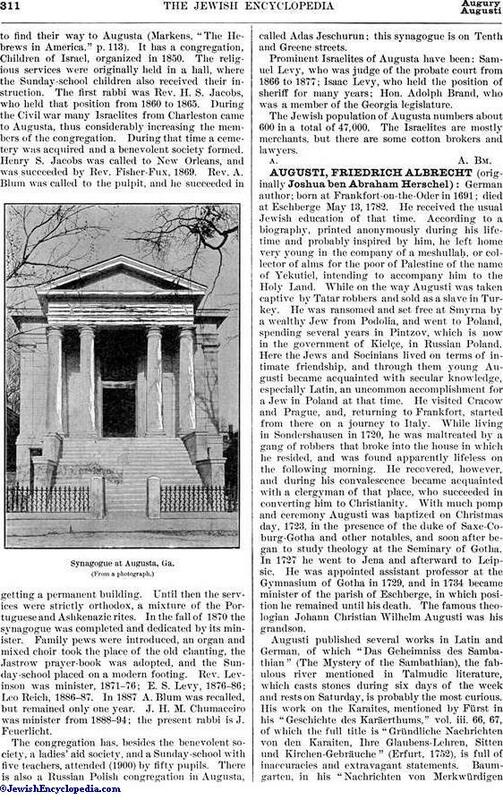 Henry S. Jacobs was called to New Orleans, and was succeeded by Rev. Fisher-Fux, 1869. Rev. A. Blum was called to the pulpit, and he succeeded in getting a permanent building. Until then the services were strictly orthodox, a mixture of the Portuguese and Ashkenazic rites. 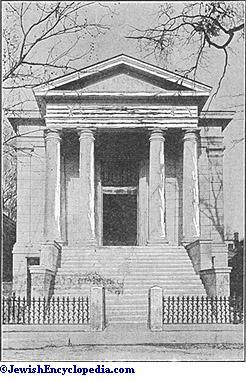 In the fall of 1870 the synagogue was completed and dedicated by its minister. Family pews were introduced, an organ and mixed choir took the place of the old chanting, the Jastrow prayer-book was adopted, and the Sunday-school placed on a modern footing. Rev. Levinson was minister, 1871-76; E. S. Levy, 1876-86; Leo Reich, 1886-87. In 1887 A. Blum was recalled, but remained only one year. J. H. M. Chumaceiro was minister from 1888-94; the present rabbi is J. Feuerlicht. The congregation has, besides the benevolent society, a ladies' aid society, and a Sunday-school with five teachers, attended (1900) by fifty pupils. There is also a Russian Polish congregation in Augusta, called Adas Jeschurun; this synagogue is on Tenth and Greene streets. Prominent Israelites of Augusta have been: Samuel Levy, who was judge of the probate court from 1866 to 1877; Isaac Levy, who held the position of sheriff for many years; Hon. Adolph Brand, who was a member of the Georgia legislature. The Jewish population of Augusta numbers about 600 in a total of 47,000. The Israelites are mostly merchants, but there are some cotton brokers and lawyers.